Tweet Stream Added to Ubuntu 12.04 Installer - OMG! Ubuntu! An auto-updating Twitter stream has been added to the Ubuntu 12.04 installer. 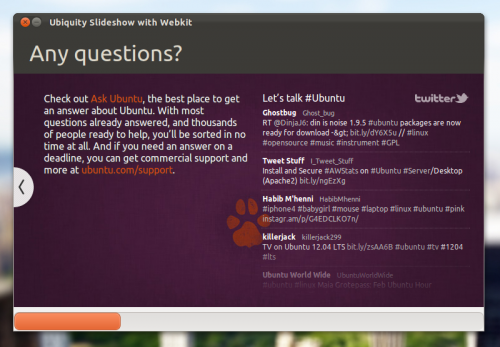 The stream shows tweets containing the hashtag #ubuntu, and appears alongside a short blurb on Ask Ubuntu. The slide, titled ‘Any Questions?’, is the last item shown during installation of Ubuntu. It might sound like a trivial, inconsequential addition to many, but it’s actually quite smart. Once a user has seen the entire slideshow the tweet stream presents them with accessible, current and varied options to explore further from, thus taking their mind off of the (short) wait whilst Ubuntu continues installing.